Marley Joe is a 6 year old Bichon and I'm a bichon rescue mom. He loves to run around and turn his bed upside and sleep under it. Marley is a fun loving and very affectionate dog. He often will come into the crook of your arm or lay in the mold of your body to cuddle with you. He makes us laugh everyday and keeps us happy. 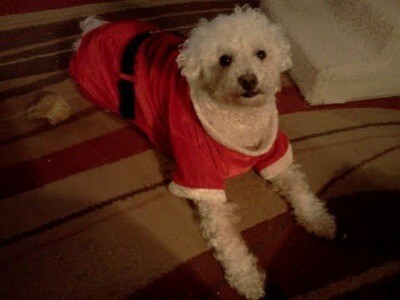 This is a pic of Marley in his Santa Suit.